The smell of chocolate, cheese, and carmelized sugar wafted through the book shelves at Yellow Springs Library on Saturday, January, 29, when the Yellow Springs Library Association presented its "Cookbooks & Brownies" annual bake sale in honor of its Founders Day. Cookies, cupcakes, and brownies were for sale along with previously-loved cookbooks with all proceeds going to YSLA to support the library. Two cooking demonstrations also took place. 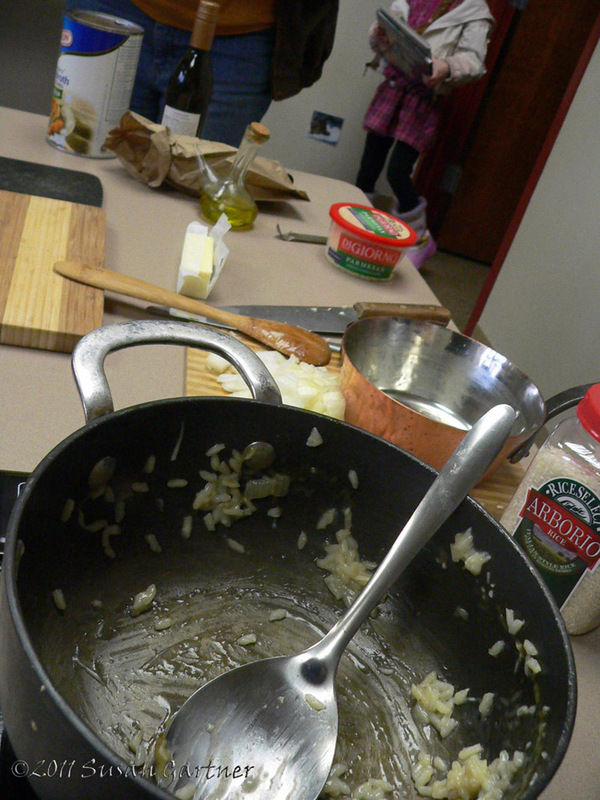 Library staffer Tricia Gelmini made Noni's Risotto (pictured) in honor of her Italian grandmother, Marie. Library patron Judith Walert-Maldonado made Budin de Pan, an Argentine Bread Pudding to honor the Buenos Aires cook, teacher and culinary personality, Dona Petrona. Editor's note: As of 10:30 Saturday morning (the end of my shift), we had received a tremendous amount of baked goods to sell, including fine breads, specialty brownies and cookies, and cupcakes that were flying off the shelves. There were hundreds of cookbooks that were also moving fast. One woman was overheard to say, "Theses are the cookbooks my mother had that I always wanted." The blogger is on the YSLA board.